Home/World News/Middle East/Iran/Iran waiting for Leader order to block Strait of Hormuz: Comdr. Iran waiting for Leader order to block Strait of Hormuz: Comdr. 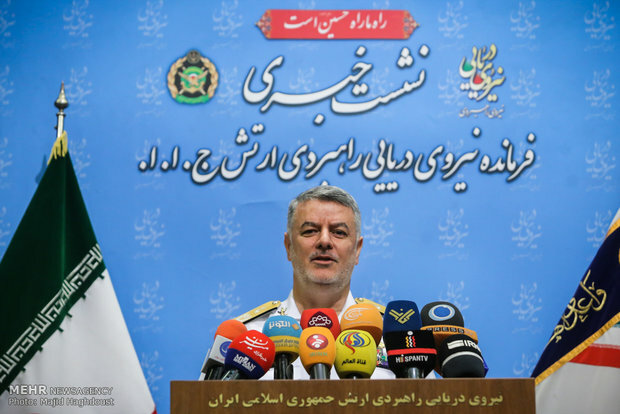 Iran’s Navy will continue preserving security and controlling ‘innocent passage’ in the Strait, he added. Certainly, cruel sanctions against Iran will affect the function of the Strait of Hormuz, which in turn will impose consequences on many other countries; “the outcome of a decision will not affect only one country but also the whole world,” he underlined. “US will not play a role in our decision over the Strait of Hormuz; Iran’s move is only dependent on the order of Leader of Islamic Revolution,” he emphasized. Elsewhere in his remarks, he referred to the International Army Games 2018, saying “this year, for the first time, the Army of the Islamic Republic of Iran hosts ‘Deep Diving’ competitions in Noshahr, from August 1 to 11, in which teams from Russia, Syria, South Africa, Venezuela, India, Pakistan, Azerbaijan, Kazakhstan and the Islamic Republic of Iran compete for 12 days.